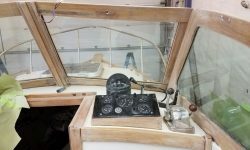 I continued work on the brightwork preparation, this time with the large windshield and dash area. 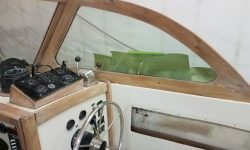 To begin, I attacked the remaining adhesive left behind by the Velcro strips I’d removed from the top edge of the windshield; the Velcro may have been slightly loose and wrinkled, but that should take nothing away from the tenacity of the adhesive residue, which fought me to the end but ultimately succumbed to a dynamic combination of solvent, light scraping, and sanding. 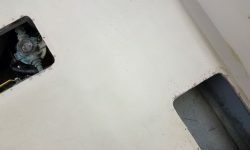 It was enough to make me wish I’d left the stuff in place from the getgo. 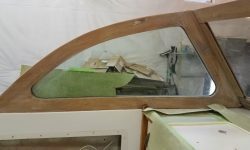 With that mess out of the way, I sanded the outer surfaces of the windshield. 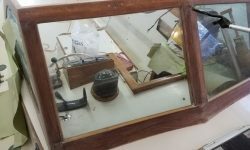 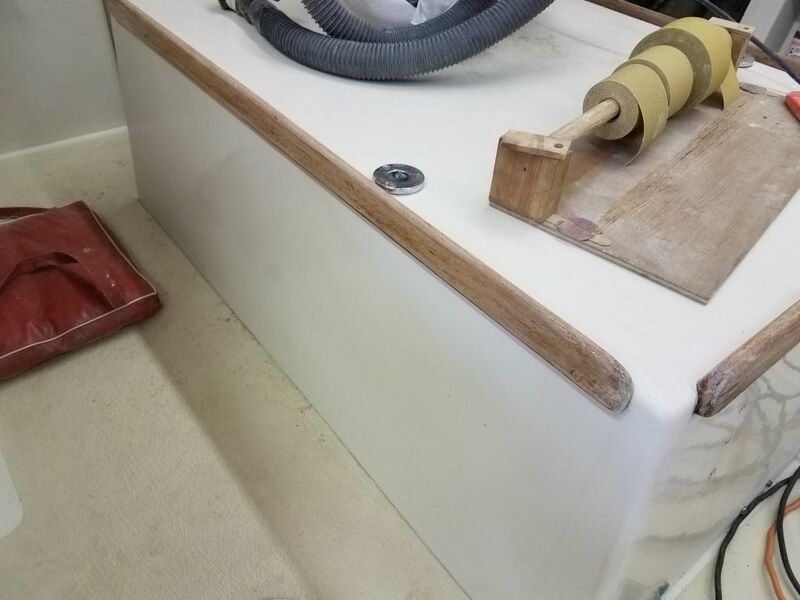 I found I had to start with 120 grit on a sanding block to get through the corrugated and grit-filled surface of the last coat or two of varnish, which had been inexpertly applied, and I followed with 220 grit on all surfaces once they were approaching smoothness. 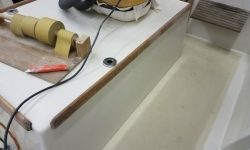 Fortunately, there was a sound base of varnish on the wood from many years of buildup, giving me the thickness required to flatten the surface without sanding through. 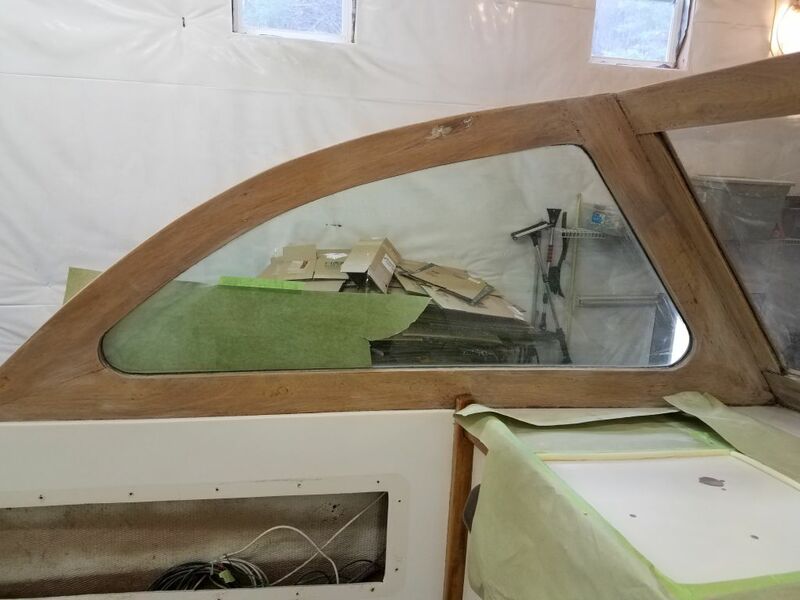 At the sides, where I had an ongoing repair to the cabin trunk masked off, I left the brightwork alone for the moment, but I’d come back and sand those final areas as soon as the gelcoat work was finished. 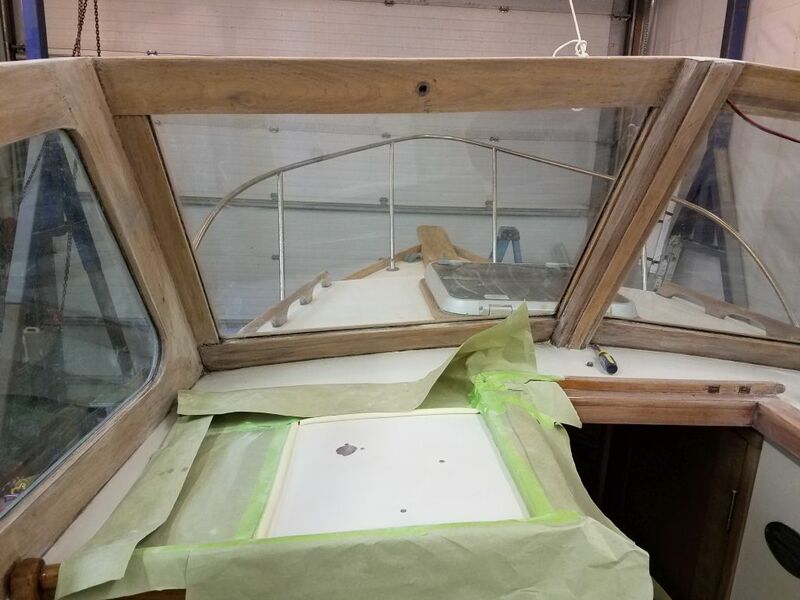 I repeated the process on the inside faces of the structure, where I fortunately found the old coating was not quite so rough, so I could use only the finer paper to prepare these areas. 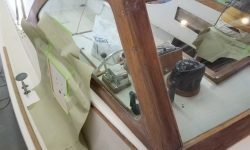 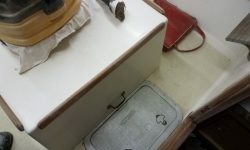 Still, it required substantial effort to flatten the surfaces as required. 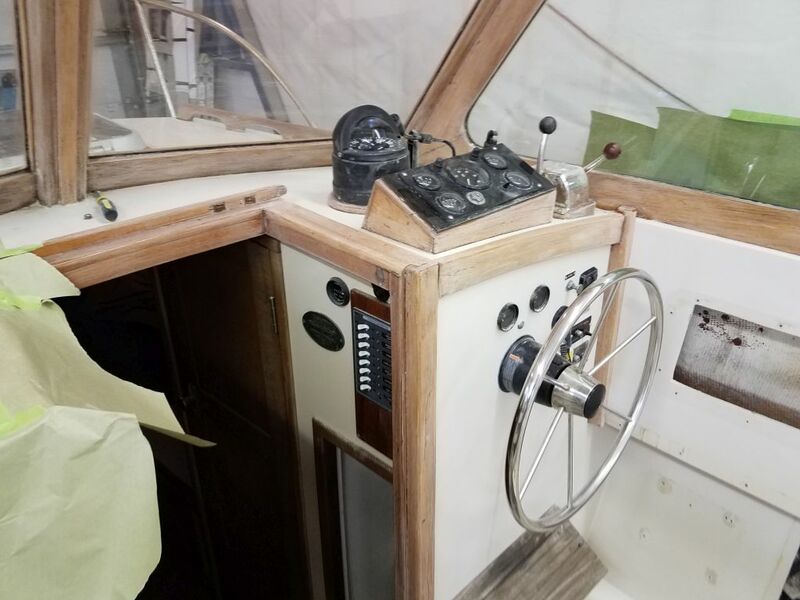 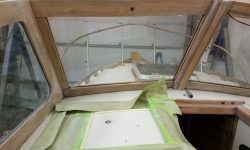 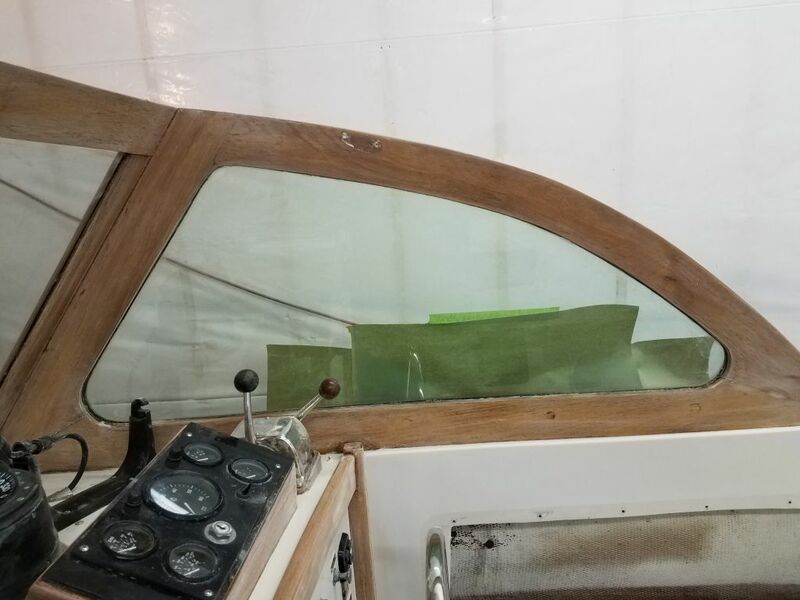 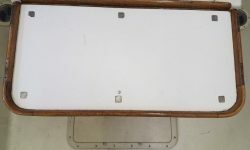 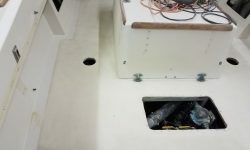 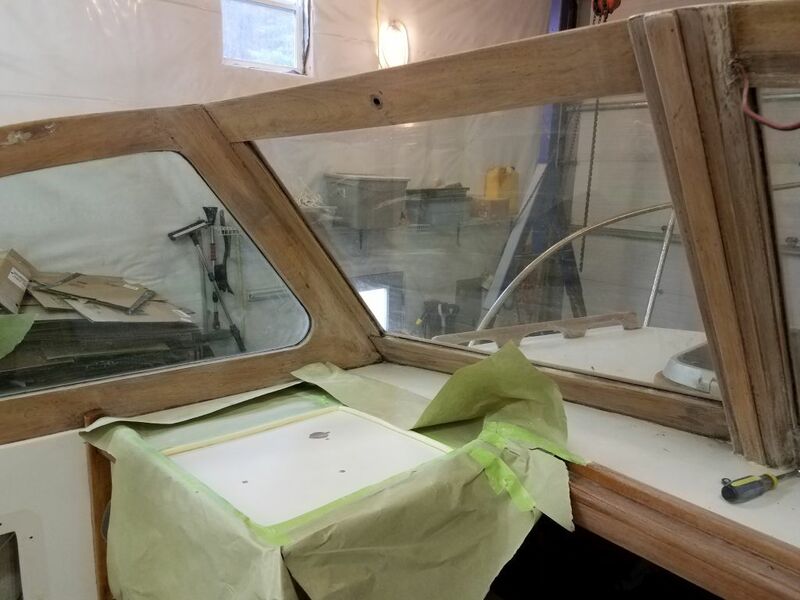 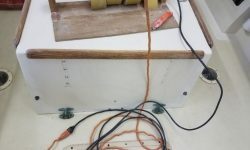 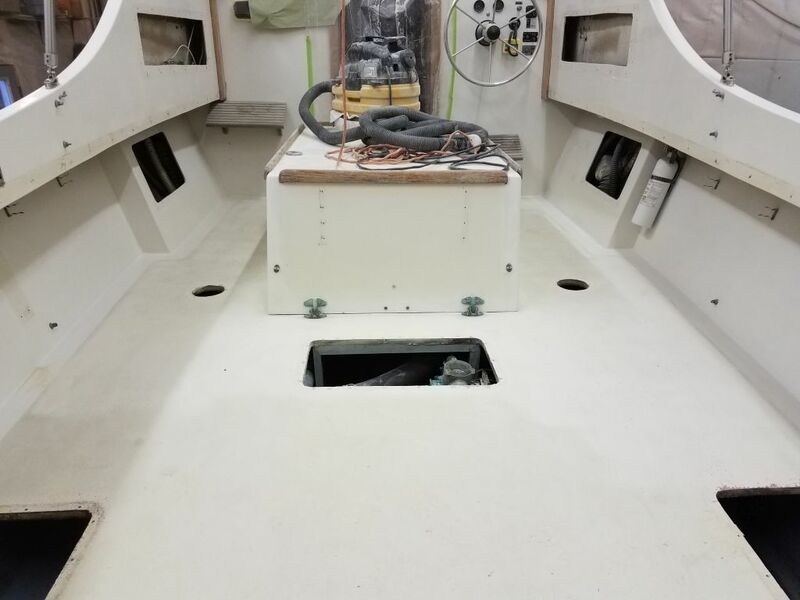 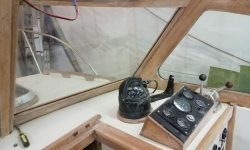 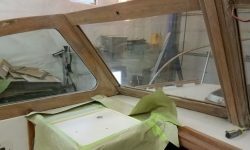 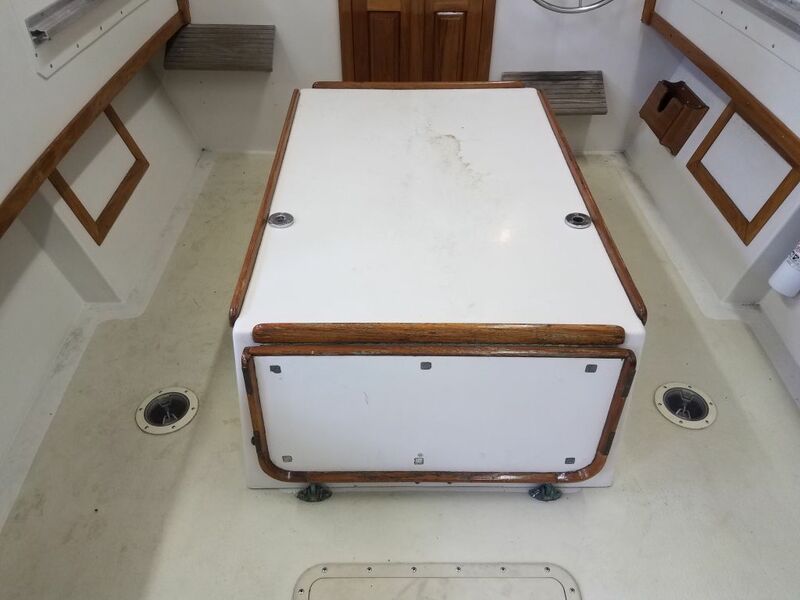 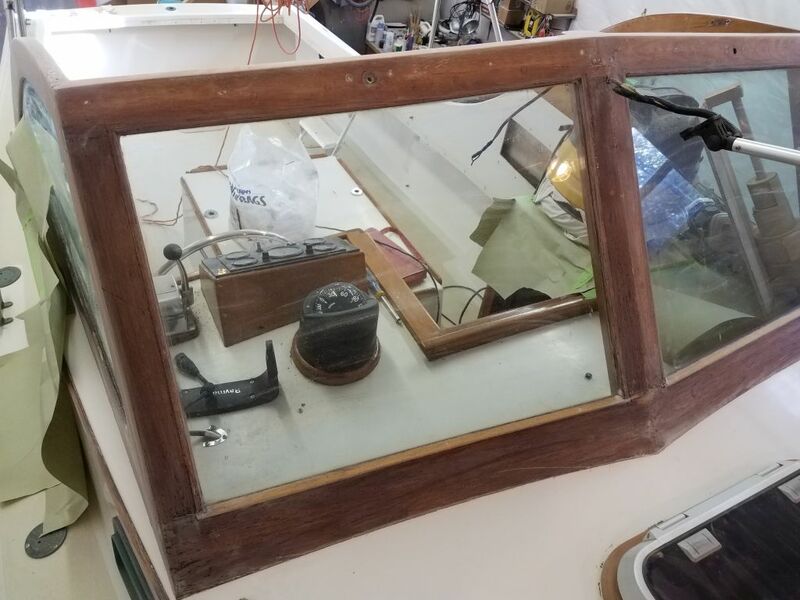 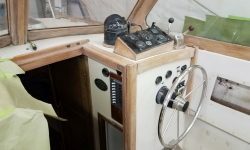 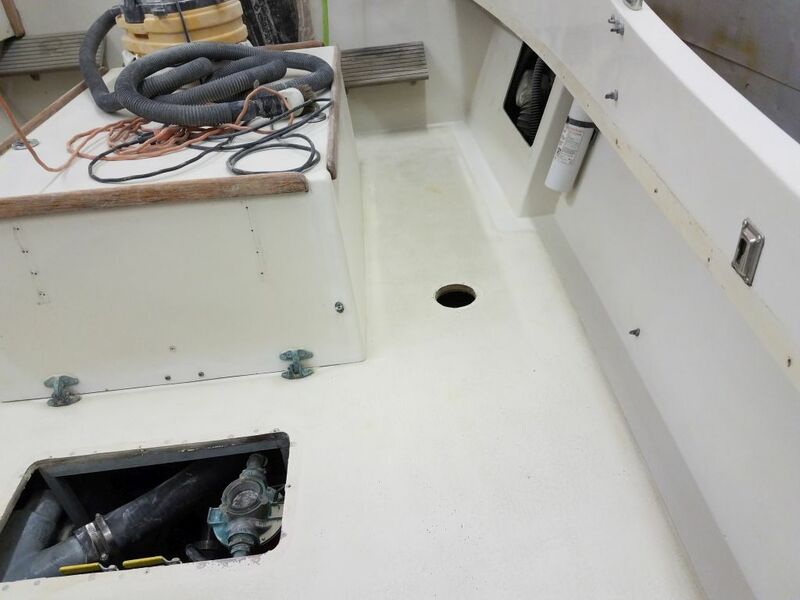 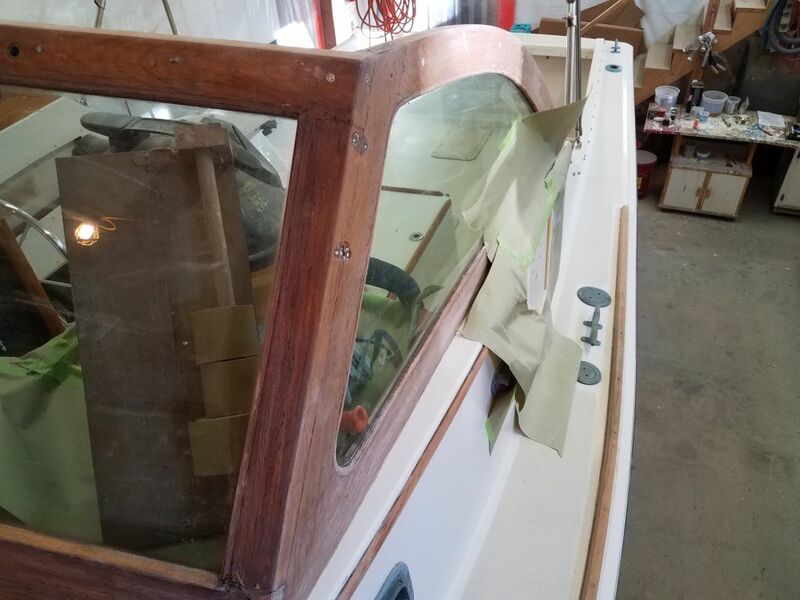 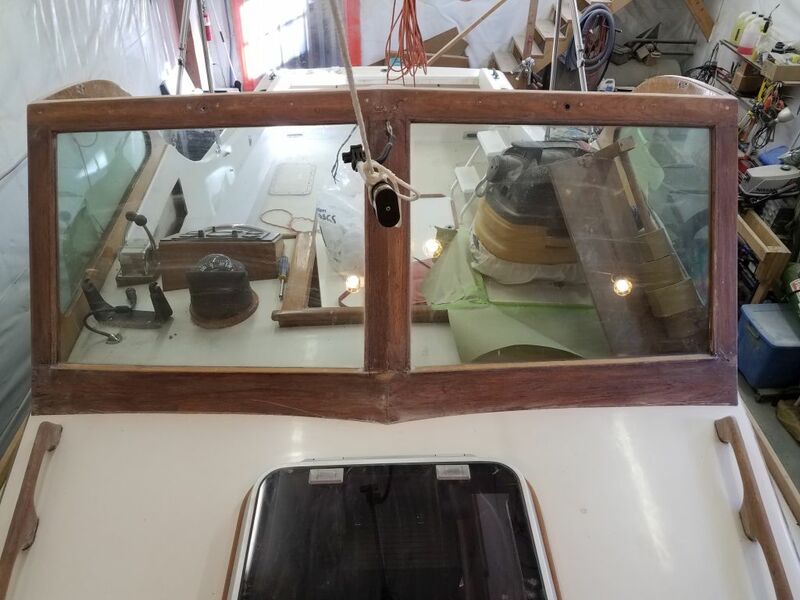 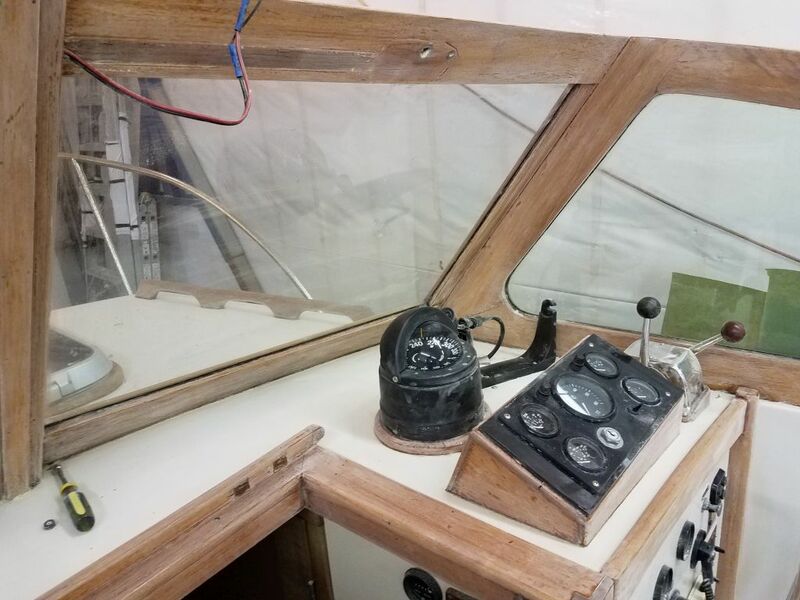 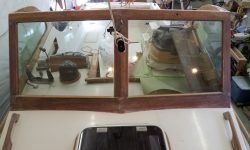 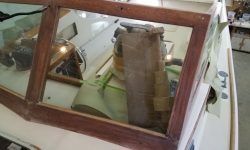 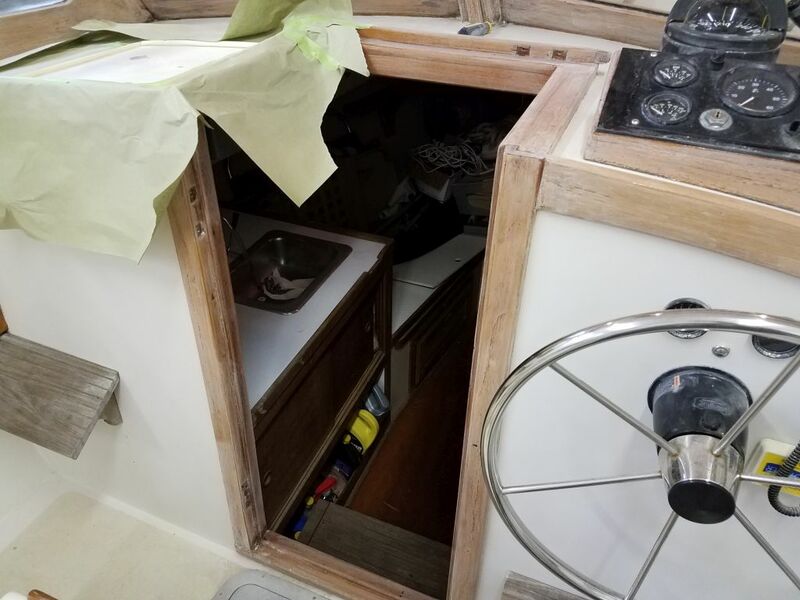 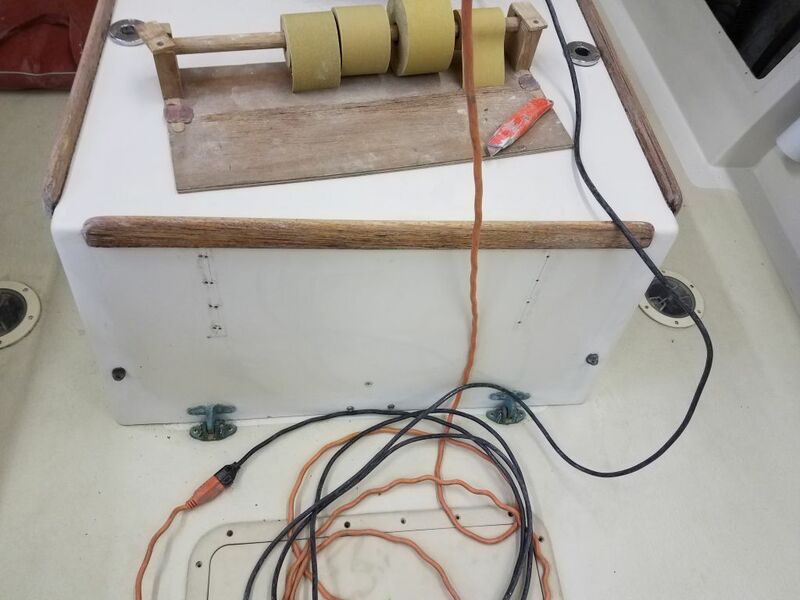 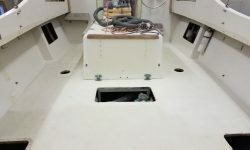 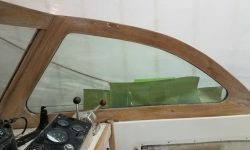 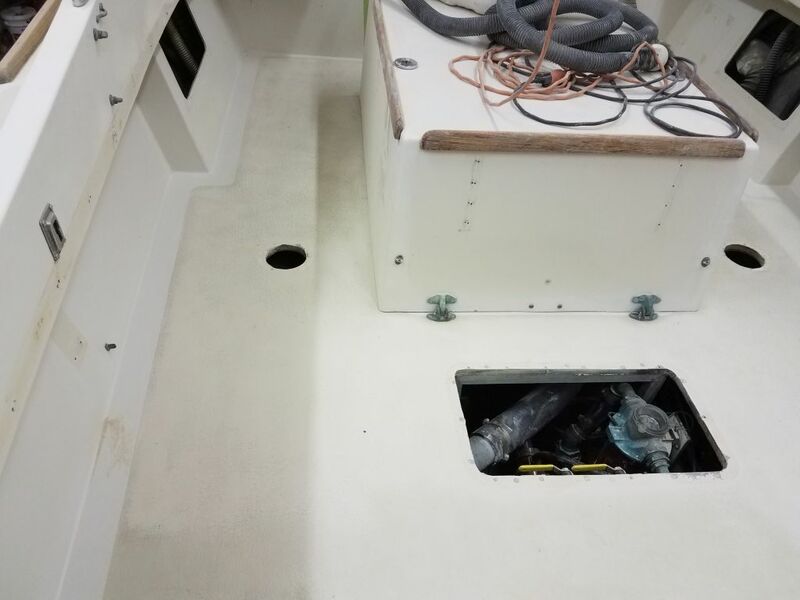 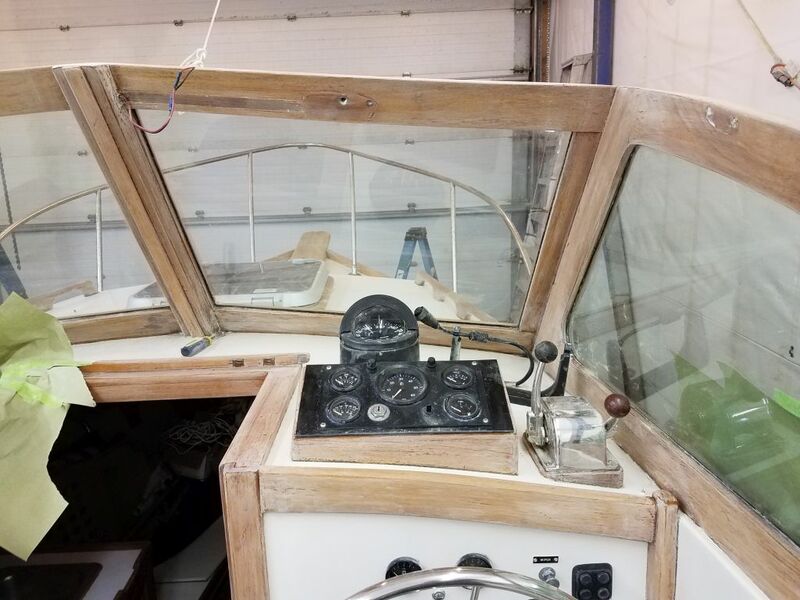 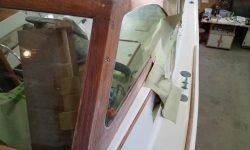 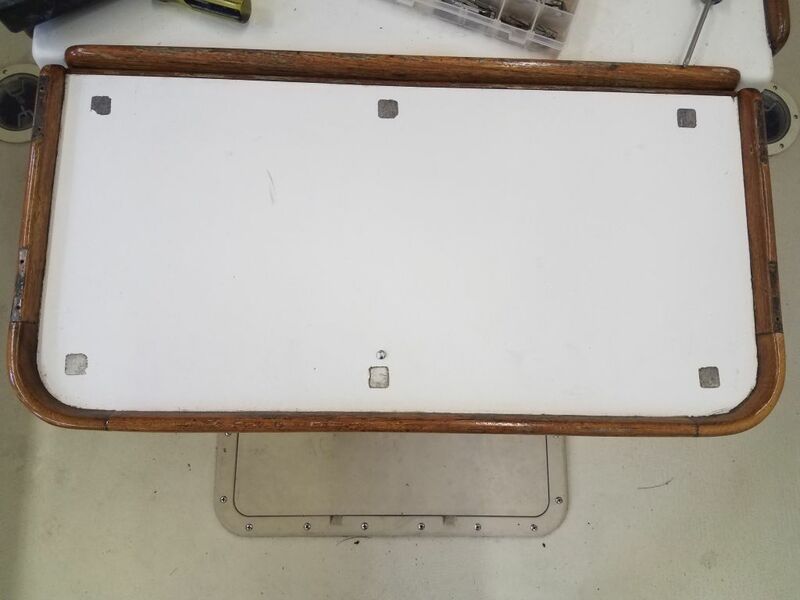 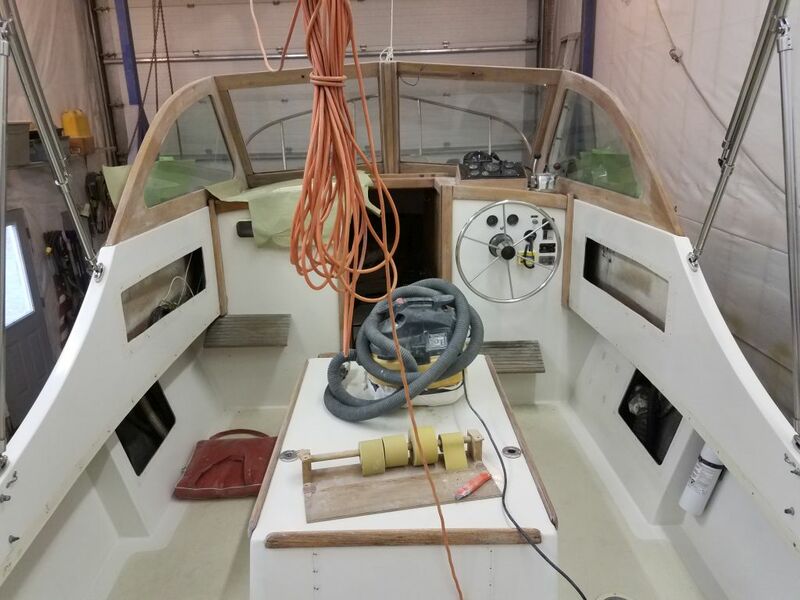 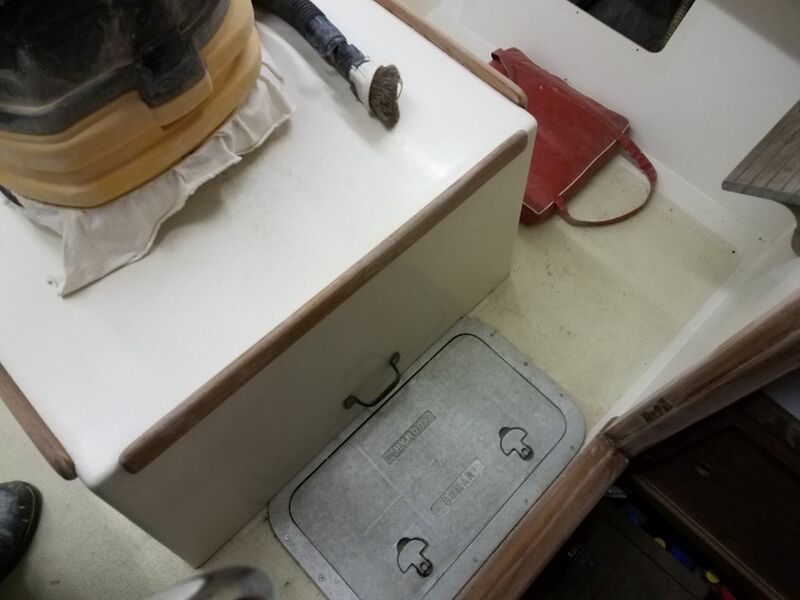 I worked my way around the windshield frame and the various trim bits around the instrument panel and controls and companionway, leaving for now the area on the port side where I’d masked off an unrelated gelcoat repair. 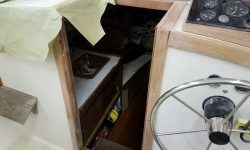 At my gentle but non-binding suggestion, the owner decided to remove a folding extension attached to the aft end of the engine box, since he never used the extension (I guess it was supposed to be a seating area, had there been a cushion) and it seemed to just sit out there in the sun and weather so the brightwork could fail, as it clearly had in the past, though the blackened and weathered spots had been varnished over at some point. 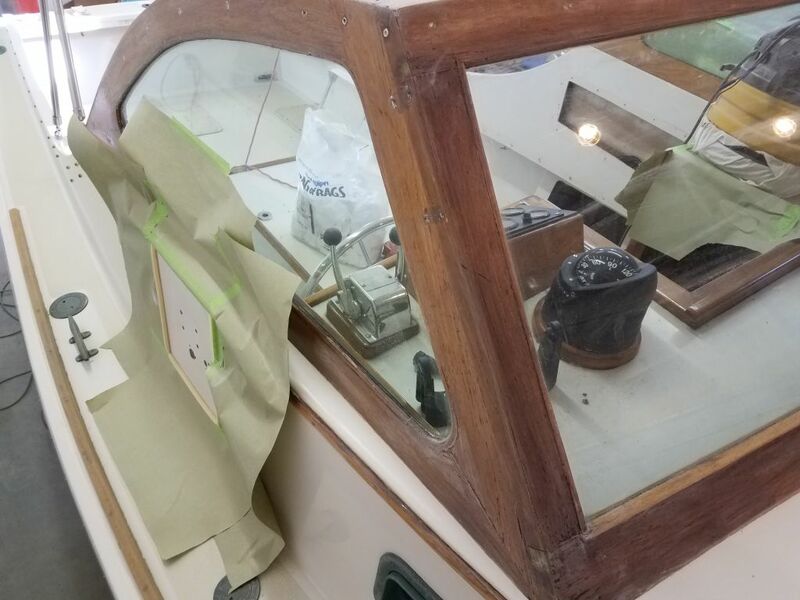 So rather than spend time preparing the varnish here for its next failure cycle, I removed the full-length hinge securing the extension, then removed the two plywood fold-out supports as well. 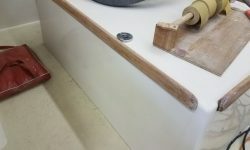 This left a few screw holes behind that I’d need to deal with, but I had a plan for that. 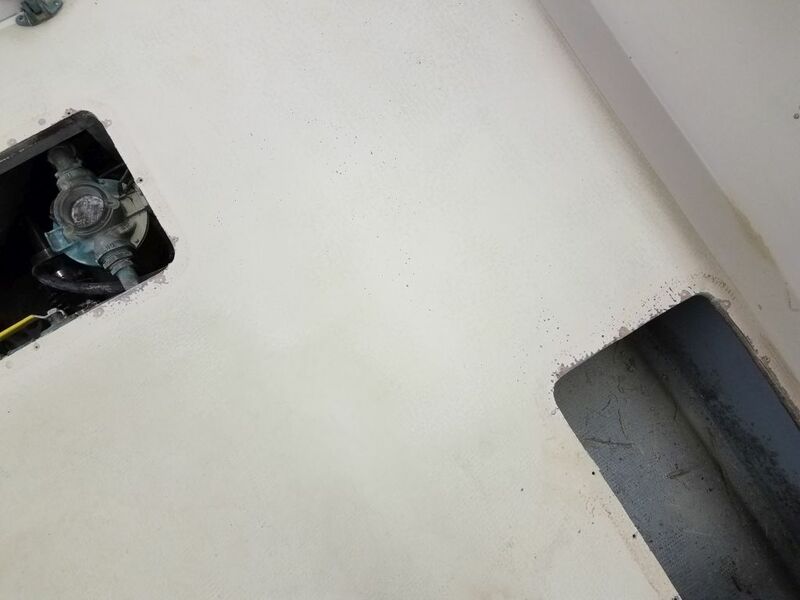 Meanwhile, I lightly sanded the remaining fiddles surrounding the top of the engine box, completing for now the main brightwork prep. 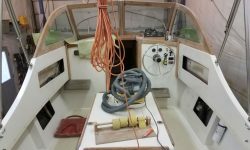 With some time left in the afternoon, I decided to begin the prepwork for the nonskid. 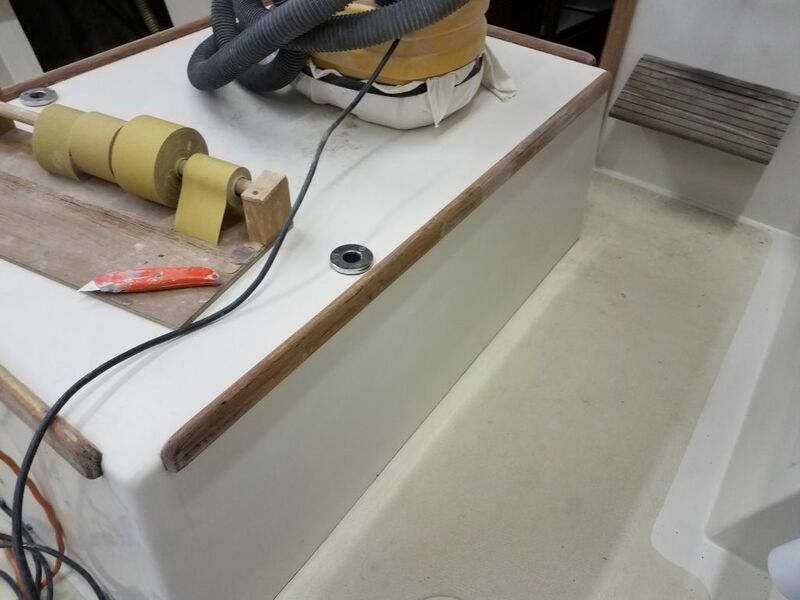 I needed to sand the existing surfaces to at least partially smooth them and otherwise prepare them for new coatings. 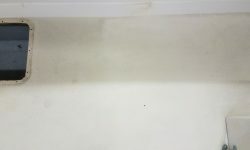 The existing nonskid appeared to be thick gelcoat that had been applied into some semblance of a nonslip surface with a roller or other application tool, but the surface was rough in texture and also rough in overall application style, and despite its rough texture it managed to be slick and slippery underfoot. 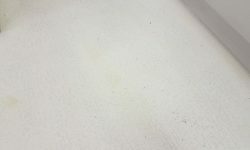 We planned a new nonskid texture that would be forgiving of substrate imperfections, which meant I didn’t need to sand the old gelcoat perfectly flat and smooth, but I did have to substantially flatten and abrade the surface to prepare for the new paint, so I got to it with 80 grit paper on my sander, starting at the bulkhead and working aft. 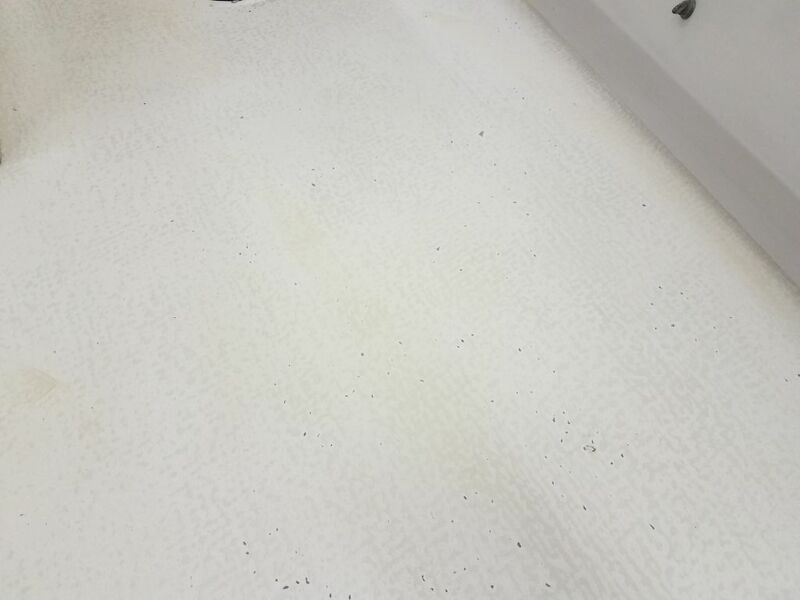 Coarser paper would have made quicker work of it, but I didn’t want to overdo it, and though it took some time, the 80 grit brought the old surface down to where I wanted it, more or less. 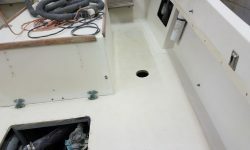 For the moment, I concentrated on the main field, but I’d have to come back later with a different tool and take care of the tight corners and borders where the nonskid met smooth white gelcoat. 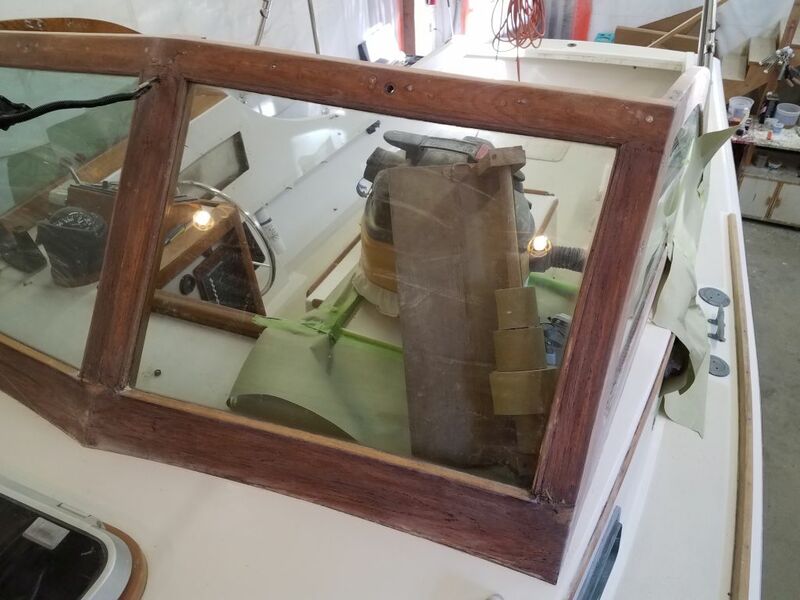 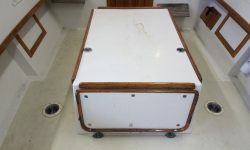 Before beginning, I used a scraper to remove the old silicone sealant from around all six deck hatches, and as I worked by with the sander I cleaned up any remnants around the openings. 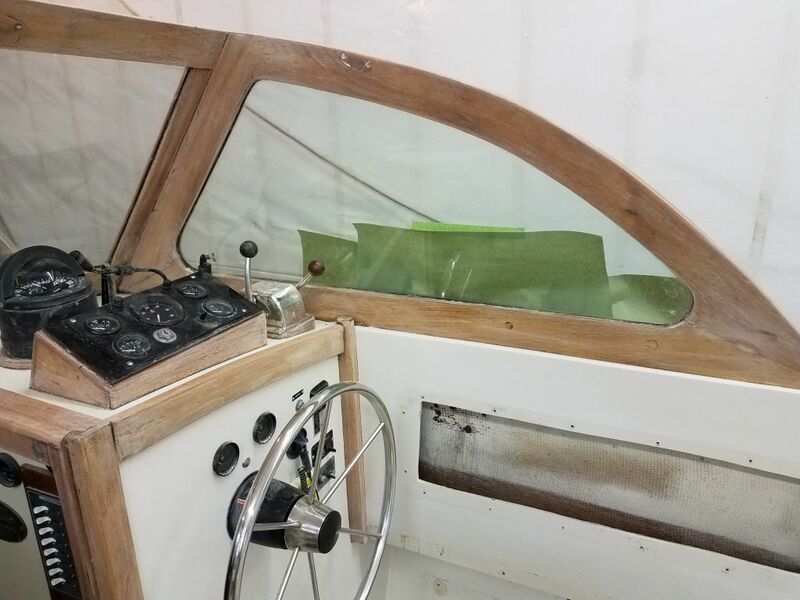 By the end of the day, I’d sanded my way back to approximately the aft edge of the hatch just behind the engine box, leaving about half the cockpit to finish up next time. 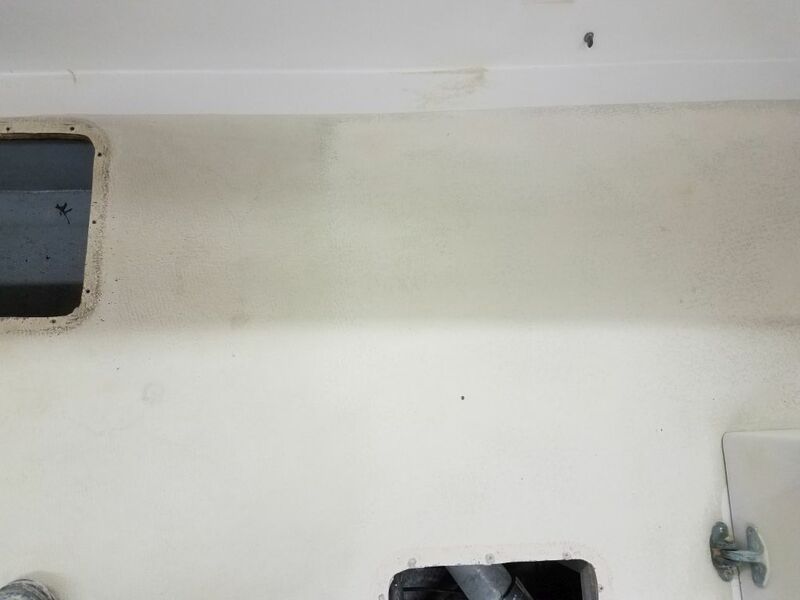 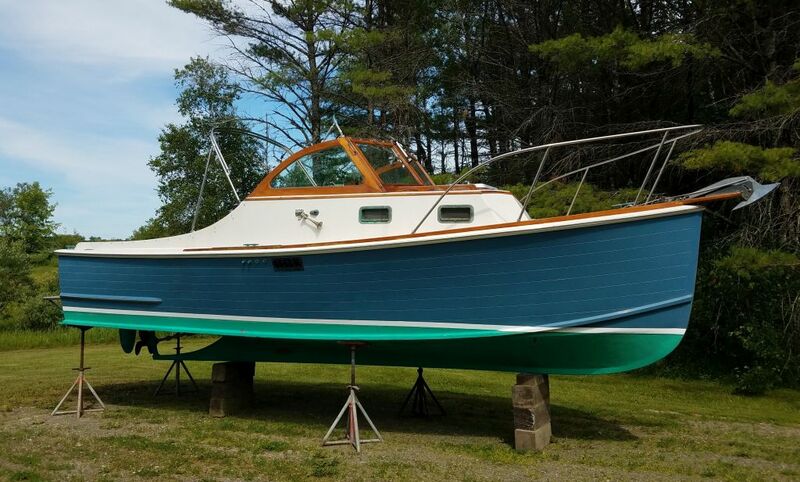 In the first photo below, the line between sanded and unsanded is visible about halfway across the photo.